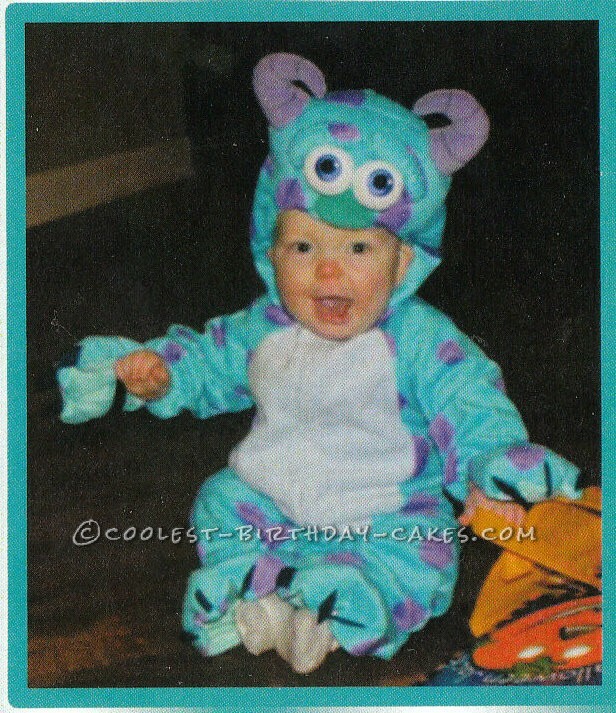 My grandson, Dylan, was Sully from Monsters Inc for his 1st Halloween and his mommy, my daughter, decided that that would be the theme of his 1st birthday party in January! She asked if I would be up to doing cookies, cupcakes and a smash cake for it! Well, of course I said YES especially since my first grandson’s 1st birthday 8 years ago, no one has done the cake except GRAM!! Daughter Becky had sent some ideas on what she was thinking and I did more investigating and searching to make her little guy’s Monsters Inc birthday cake special! Come on down and have some fun! Our little monster is turning one! Now before anyone gets upset because this is about CAKES, let me tell you that this was all part of the WHOLE picture! 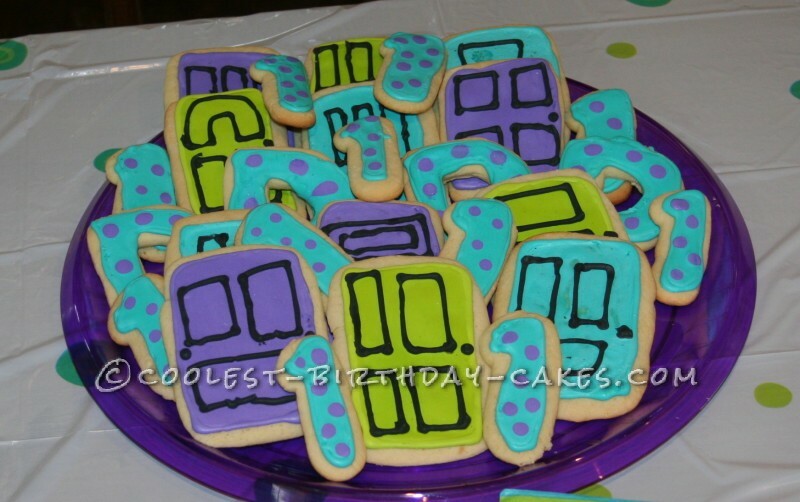 Did 3 batches of sugar cookie dough and cut out doors (after all, how do the Monsters get in? 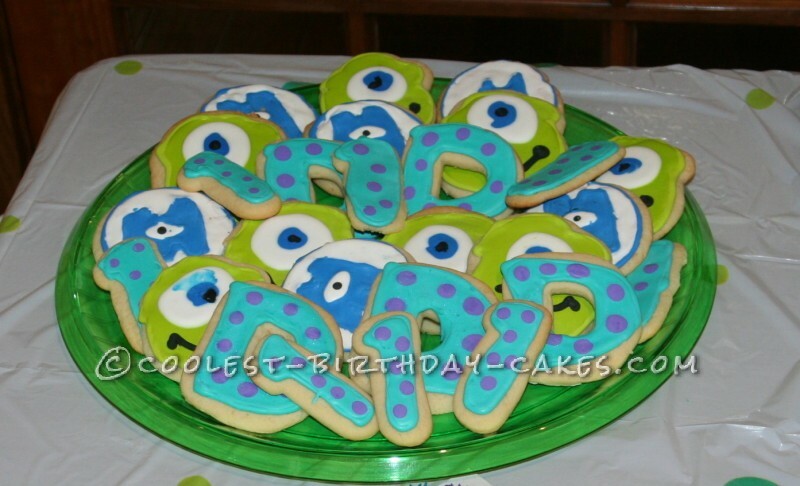 ), D’s for Dylan, 1’s because he’s one, Mike Wazowski’s and round. The D’s and the 1’s were decorated to look like Sully’s. The doors were decorated in the 3 major colors of teal, green and purple. 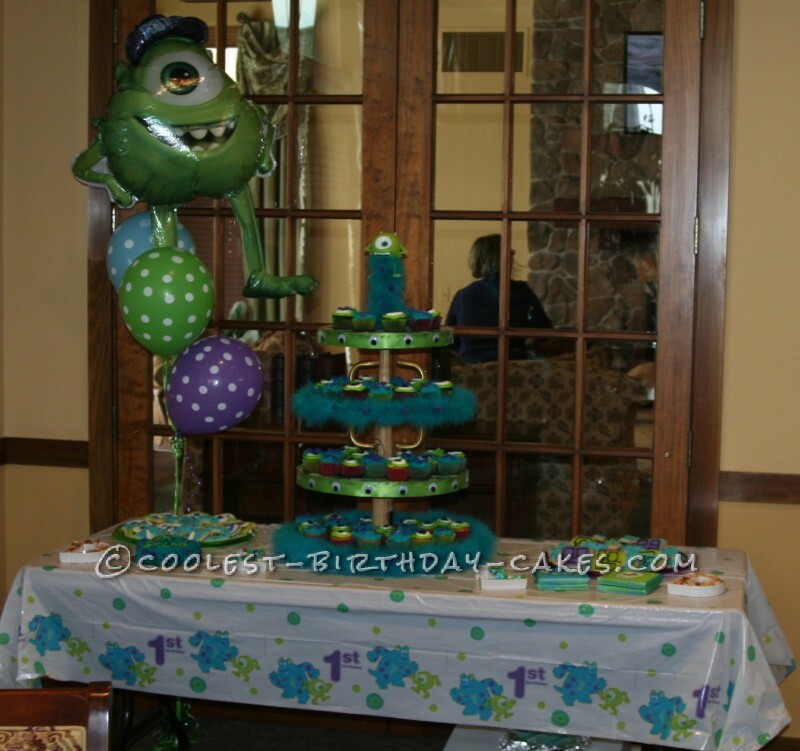 Mike Wazowski….well, he’s self explanatory! 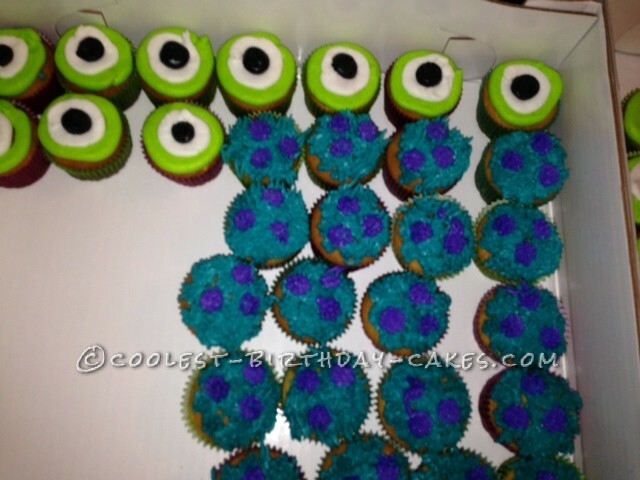 The round ones were decorated with the Monsters Inc logo! Cookies were a fun touch! Where will these doors lead? Baked 1 batch of chocolate, 1 batch of white and 2 batches of funfetti (part of which went to the smash cake). Mixed a double batch of decorator icing and colored it green, black, teal, purple and left some white. They were very simple using the largest Wilton round tip! Mike Wazowski got a green ring around the outside of the cupcake, the ring was filled in with white icing and black icing for the pupil! The ones dressed like Sully were equally as easy using the Wilton grass tip! Filled the whole top of the cupcake with teal “fur” from the grass tip then went back with random purple “fur” spots! Cupcakes look pretty scary in a box! Baked a 6″ round funfetti cake! Using the icing made for the cupcakes it became a Sully! All over teal “fur” again with the random purple “fur” spots. To finsih the look, 2 horns that I had made using candy discs melted and put into a seal shell mold I had! 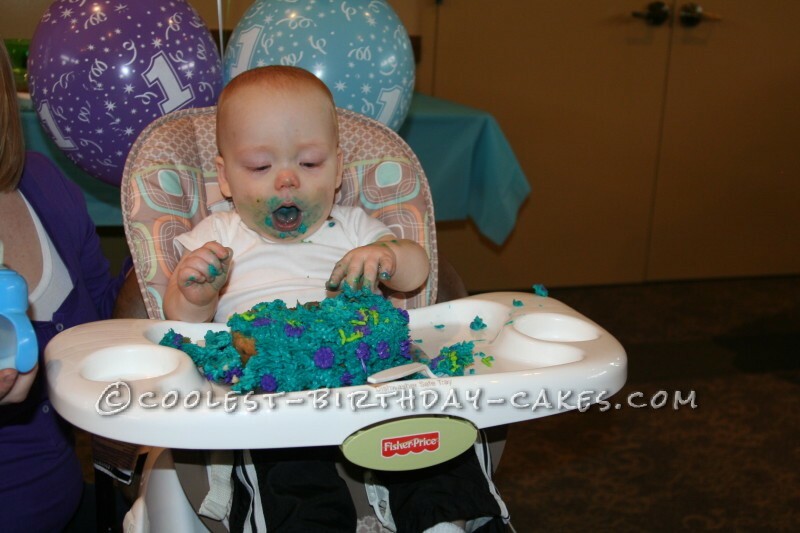 Smash cake looked like Sully! 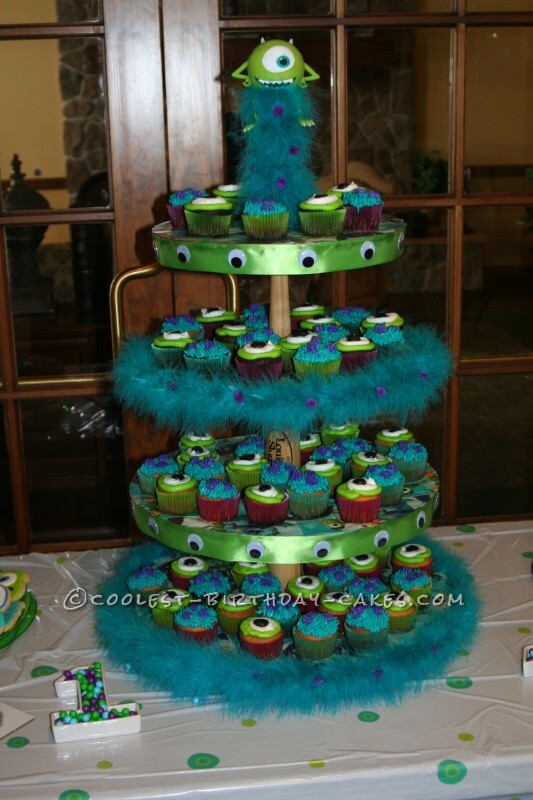 PRESENTATION IS EVERYTHING: To bring it all together I created a Monsters Inc Cupcake Stand! To do this I took a Baseball cupcake stand that I had made a couple of years ago and gave it monstrously new look! Mike Wazowski tops it! He is actually a punching bag that I found at Toy R Us that I cut a whole in the bottom and stretched him over the baseball that is at the top of the stand! Covered the baseball bat handle with teal fur that has purple balls glued randomly on it! Then every other wood round has with green ribbon with eyes glued on it or teal fur with purple dots. The only thing I regret is having more fur to cover up the parts of the bat that separate the wood rounds. Cupcakes looked yummy on the stand! The whole table looked amazing! 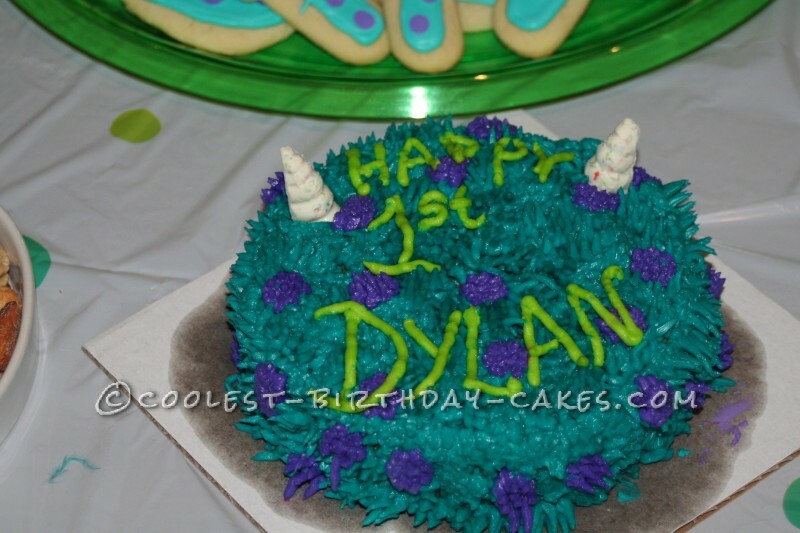 And Dylan LOVED his smash cake! Priceless memories for this Gram and not scary at all! Everything pulled together to make a not so scary party!